Boston Blackie. What a name for a good guy. It is an excellent name for a bad guy turned good guy. Blackie, who was created by novelist Jack Boyle, was originally a jewel thief, safe cracker, and confidence man. Blackie changed his ways and became a private investigator though the local police still suspected him of being a bad guy. Of course there is always a girl and Blackie’s girl is Mary Wesley. She helped Blackie in many ways with solving cases, running interference, and being an all around girl friday. His good friend and chauffeur, Runt, was also a part of each adventure. Inspector Farraday was Blackie’s police foil. Always suspicious, Farraday was constantly trying to arrest Blackie for something. The old time radio show was originally a summer replacement for Amos and Andy in 1944. In April of 1945, Boston Blackie was added to the radio line up permanently and was on the air until 1950. Including the 13-week replacement shows, there were 233 original episodes that aired from 1944 to 1950. Of those 233, approximately 198 episodes are available. 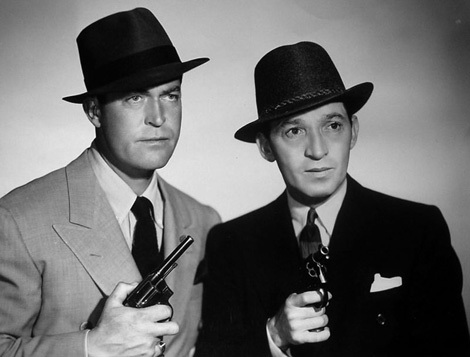 If you want to hear Boston Blackie solve crimes and sometimes lead Inspector Farraday on a merry chase, check out Old Time Radio. Listen to a sample episode at Boston Blackie’s page and enjoy.